George Bartleson and Nadia Diaz Funn. 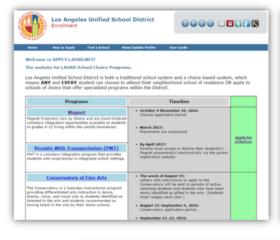 LA Unified is preparing to launch this fall its new and easier way to apply to different kinds of schools within the district, but the system is not going to include charter schools. Not yet, anyway. And that’s not acceptable to stakeholders throughout the district, even those usually on opposite sides of the table. The Unified Enrollment program is scheduled to be ready for the 2017 fall semester rollout, according to a presentation at a Tuesday committee meeting. The system will make it easier for parents to enroll their children in magnet schools, dual language programs, early education centers, and other alternative district school options. With the online system, parents won’t have to fill out applications multiple times, they can change their options faster, and they can find out what the choices are in a simpler way, according to the district staff making the presentation to the Early Childhood Education and Parent Engagement Committee. Bartleson explained that the system helps families find school options, but including charter schools will take at least a year or more. More than 155,000 families are already registered in the system at apply.lausd.net, and 12,000 teachers will be trained over the summer to help parents with the process, said Chief Academic Officer Frances Gipson. The soft-launch has identified some issues already as the district prepares to integrate the system to find local schools and their availability. Bartleson said he envisions help being offered at parent centers during open houses, and even a possible roving mobile van to help families sign up and figure out the best educational options for their kids. Robin Potash said charters should be included sooner. But for now, those options won’t include the local charter schools in their neighborhoods. In fact, the system won’t even include the local affiliated charter schools, which are run by the district but often have their own lottery systems and waiting lists. 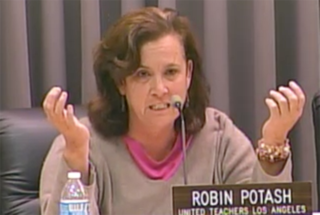 One of the committee members, Robin Potash a teacher representing UTLA, said it was important for the district to include charter schools in the list of options and to do it faster than their present timeline. But even the district-operated affiliated charters and independent charters co-located with traditional schools pose a problem for quick integration into the system, said the district’s Program and Policy Development Advisor Jodie Newbery. 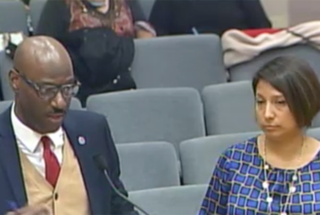 She said that some of the affiliated charter petitions may have to be changed and the independent charter schools will be involved in the enrollment on a case-by-case basis. The plan is that the charter school option would be included in the third and final phase of the Unified Enrollment implementation. Even though that wouldn’t wouldn’t take place for at least a year, the committee offered enough push-back that perhaps that could change, or at least local charters could be added as an option that’s listed on the site. “Public education is not supposed to be a competition, so I think it’s important to bring it all under the same roof as soon as possible,” Potash said. Nadia Diaz Funn, the executive director for the nonprofit Alliance for a Better Community, is working closely with the district on addressing barriers that make it harder for minority families to find good school choices. An example of the form for the Unified Enrollment. Bartleson interrupted Funn’s presentation to explain that the district is involved with the coalition of community organizations —including Parent Revolution, Partnership for Los Angeles, Los Angeles Urban League and others — that is calling for the Universal Enrollment. The district staff is seeking to contract out technical experts to combine the application process with the district’s PASSport (Parent Access Support System Portal) system that helps track a student’s academic progress. In the next three weeks, LA Unified will decide on the company to move forward with its plan to have the site up by late summer and ready for fall 2017. Among the obstacles are standardizing all the school rules, coordinating the timelines, and creating an equitable entrance system so that all students have equal access to all the programs, Newbery said. Applicants to schools in a family’s neighborhood will still get priority status. Staff member Dunia Fernandez said the next step is to get parent and community engagement, and three meetings are planned for March 23, April 19, and May 5 to get suggestions and ideas from families who will be using the system. School board member Mónica Ratliff said she was concerned that there were not enough meetings and they should be held throughout the district. “I’m concerned that this will be another meeting with staff and food and maybe three parents show up,” Ratliff said. She suggested piggybacking the three meetings to get parent input with other district-wide informational campaigns rather than holding standalone events.